Heather Hoch Curly Wolf Kombucha is as much about health as it is flavor. Timothy Johnson makes each bottle of Curly Wolf Kombucha by hand. You could say it all started with Lindsay Lohan—yes, that Lindsay Lohan. In 2010, the infamous starlet claimed that she had tested positive for alcohol, thus breaking her probation, because she had been drinking too much kombucha. While it's true that, as a fermented beverage, kombucha does contain a very small amount of alcohol, what happened next in the world of the probiotic tea was a pretty surprising response to some shaky logic. Kombucha makers, like GT Dave's, all participated in a voluntary recall, leaving kombucha lovers high and dry without their beloved beverage. Timothy Johnson was working at the Food Conspiracy Co-op at the time and decided that he would just start making his own. "I basically made the worst kombucha for about a year," Johnson says. "It was so vinegary ... I had no concept of pathogens or bacteria." But, it's from those very humble beginnings, that Johnson would begin developing the recipes that would eventually grow into Curly Wolf Kombucha. A few years later, while living in Los Angeles and working at both a juice bar and a Whole Foods, Johnson says his relationship with regulars showed him that, even after the established names came back on the market, people were looking for something different out of kombucha. "My stuff was not sweet. It was bubbly and stronger," he says. "I started to see that people wanted the kind of stuff that I was making." However, the cost of renting commercial kitchen space in L.A. wasn't feasible for Johnson, and he soon went back to school to finish his degree. After graduating, he was working at a job in digital marketing in Scottsdale, waking up at 5 a.m. and commuting an hour every morning—not exactly his ideal living situation. "One morning I woke up to go to work and thought, 'You know what? F this," he says. He realized he could move back home to Tucson and turn his dreams of forming his kombucha business into a reality—after all, he had been home-brewing and fine-tuning his recipes the past few years anyway, learning more about the chemistry behind the drink. "My dream dwindled, but it never died," Johnson says. Johnson spent the first half of 2015 acquiring the proper permitting for his business and was approved to start selling his wares in July. He released his kombucha through his first retail partnership with Café Passé (415 N. Fourth Ave.). While asking Exo Roast Co. (403 N. Sixth Ave.) for bottle labeling advice (he loved the sleek look and feel of their cold brew labels), Johnson got his second retail location, followed by 5 Points Market (756 S. Stone Ave.) and the Food Conspiracy Co-op (412 N. Fourth Ave.). In the future, Johnson looks to "corner the downtown market," as he seeks to add his offerings to Johnny Gibson's Downtown Market and even put his kombucha on draft—a big trend in other cities right now, but one that has yet to catch in Tucson—at local bars. "They make easy cocktails," Johnson says, adding that he likes to combine mezcal with his Old Fashioned flavor. "I think it's good, but I might be biased." 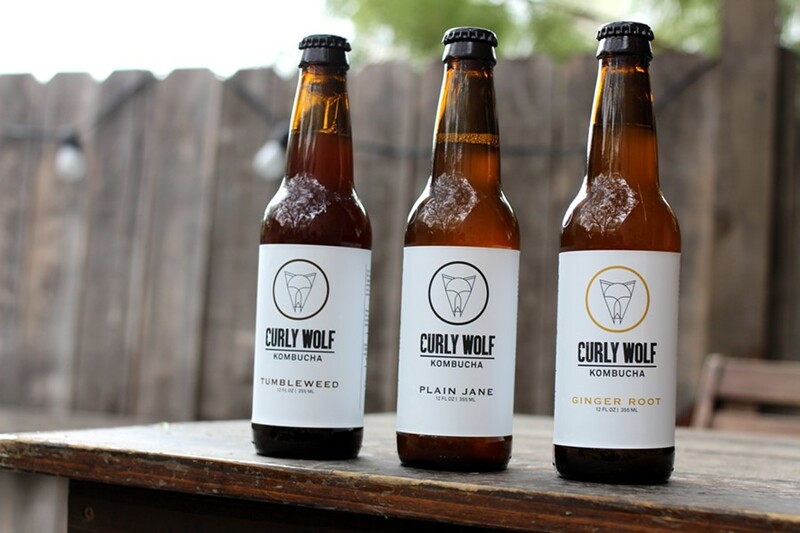 Currently, the four Curly Wolf Kombucha flavors are Plain Jane, Ginger Root, Old Fashioned and Tumbleweed. Plain Jane is, as the name suggests, just Johnson's straight up organic kombucha blend, which combines green and black teas with live cultures and cane juice and is aged in toasted American oak barrels for one to two weeks. The Old Fashioned adds in cherry, orange and digestive bitters, mimicking the classic cocktail it's named after. The Ginger Root packs an intense gingery flavor, opting for a spicy take on the root, rather than the sweeter route other ginger drink makers take. Last but not least, Tumbleweed is Johnson's homage to root beer, blending sarsaparilla, star anise, licorice root, vanilla, cinnamon, molasses and expressed orange peel for a full, rich flavor. Johnson estimates that he is producing about 30 gallons per week, though he is looking to get into "big boy stores" like Whole Foods and Sprouts in the future. However, Johnson's mission to handcraft a healthy drink (each 12 ounce bottle has less than 50 calories) will always be at the forefront. "I started drinking kombucha for the probiotics and then got into the more wholesome approach of fermented foods," he says. While fermenting might be having a moment in the culinary spotlight, Johnson's experience in the last six years making the drink show it is more than just a fad for him. 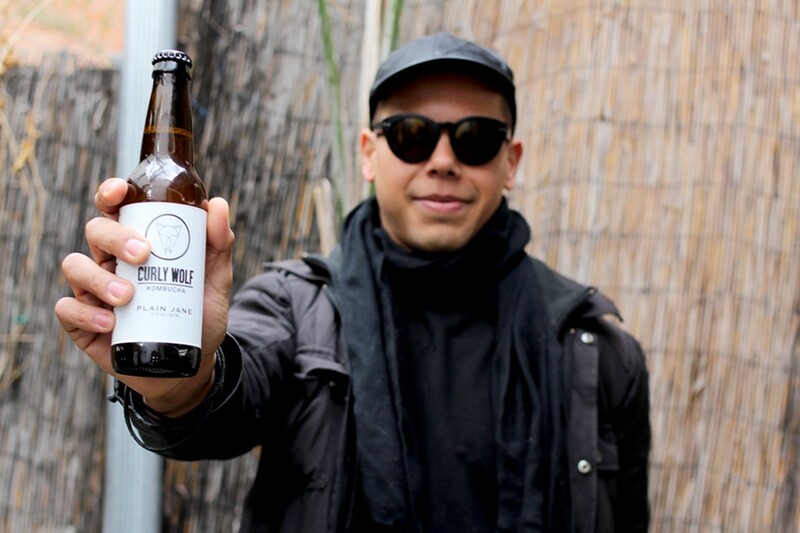 With hip, modern branding, his bottles, which run between $4 and $5 depending on where you purchase them, stand out from other kombucha brands, which tend to go for a more New Age-y aesthetic. With those unique, more adult flavors and a distinct brand identity, chances are if Lindsay Lohan saw a bottle of Curly Wolf, she'd be enticed to pick a couple of bottles up for herself—but then, who wouldn't? For more information on Curly Wolf Kombucha, visit the Curly Wolf website at www.curlywolfkombucha.com.